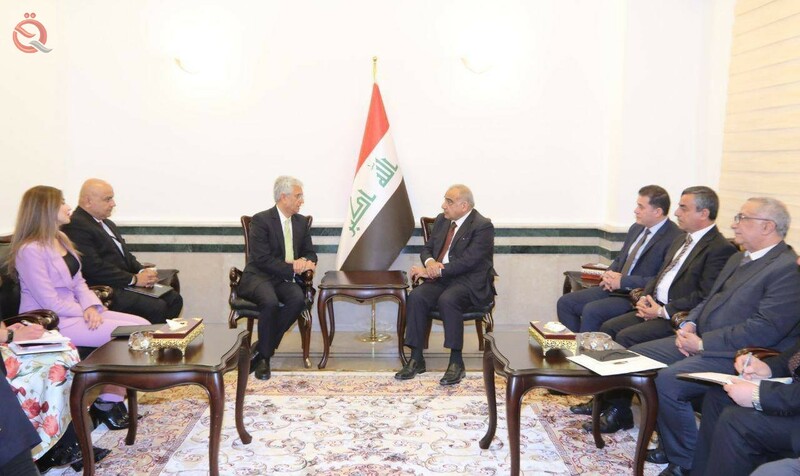 Prime Minister Adel Abdul Mahdi and World Bank Executive Director Hassan Mirza on Monday urged ways to revitalize Iraq's economy. In a statement, the Information Office of the Prime Minister said that "Abdul Mahdi received the Executive Director and the Dean of the Executive Council of the World Bank Dr. Hassan Mirza and his accompanying delegation. The meeting was attended by the Regional Director of the Mashreq countries to the World Bank, The Director of the International Finance Corporation's Office for the Levant and the Director of the International Finance Corporation's Office in Iraq. " The President of the Republic Barham Saleh, on Tuesday, Iraq's desire to cooperate "optimal" with the World Bank, while the delegation of a delegation from the bank to support the Iraqi economy. "President Barham Salih received at the Peace Palace in Baghdad today the delegation of the World Bank headed by the Executive Director and the Board Dean of the Bank Group, Maza Hassan and the accompanying delegation," the Presidency said in a statement received by the economy news. Saleh expressed "Iraq's desire to cooperate optimally with the World Bank in various fields to achieve prosperity and progress of the country," pointing to the need to "promote employment and investment in the field of projects and economic and social development." head of the delegation of the World Bank to" support the Iraqi economy, "expressing" the desire to expand the horizon of cooperation in all areas. " Prime Minister Adel Abdul-Mahdi discussed with the Executive Director of the World Bank, Hassan Mirza, the government's directions on reconstruction, solving housing problems, ways to activate the economy and cooperation between Iraq and the Bank. "The Prime Minister Adel Abdul-Mahdi received the Executive Director and the Dean of the Executive Council of the World Bank Hassan Mirza and the delegation accompanying him," noting that "during the meeting discussed the direction of the Iraqi government towards reconstruction and solving problems Housing and ways to activate the Iraqi economy and cooperation between Iraq and the World Bank. " "The meeting was attended by the Mashreq Regional Director for the World Bank, the IFC Regional Director for the Middle East, the Special Representative of the World Bank Group in Iraq, the Director of the International Finance Corporation's Office for Mashreq and the Director of the International Finance Corporation Office in Iraq." Minister of Commerce Mohammed Hashim al-Ani met with the World Bank delegation and discussed with him the support of the ration card and programs to support the Iraqi private sector and increase its capacity to be a key partner in the planning and planning of economic policy. The ministry said in a statement received by "Al-Gharab Press" that "Al-Ani said that the state budget in recent years was affected by the fluctuations of oil prices, and had to be alternatives to the development of infrastructure projects that provide services to all citizens was the best to go to invest and establish real partnerships for the Iraqi private sector With its counterparts in other countries of the world, and we have sent messages to reassure investors to enter into large investments and opportunities in the Iraqi market. He pointed out that "the ration card represents realistic solutions to the problems of the economic situation of a large proportion of Iraqis, but the weakness of financial allocations in the public budget causes us many problems in the stability of processing operations and contribute to reduce the increase of poverty facing many Iraqi provinces, and this needs to be coordinated with The World Bank to contribute significantly in projects aimed at addressing the problems in the development of the ration card system, which includes the majority of our people. He pointed out that "the ministry has different ideas for the development of the ration card and increase its vocabulary." For his part, the representative of the World Bank expressed his desire to enter strategic projects in Iraq, especially in the development of the Iraqi private sector and create the conditions for the performance of its role.